Posted on Wednesday, August 19th, 2015 by UNCG Research. “I would much rather spend my summer looking at math than on a beach somewhere. It’s just more exciting,” says undergraduate MaLyn Lawhorn, without a hint of sarcasm. 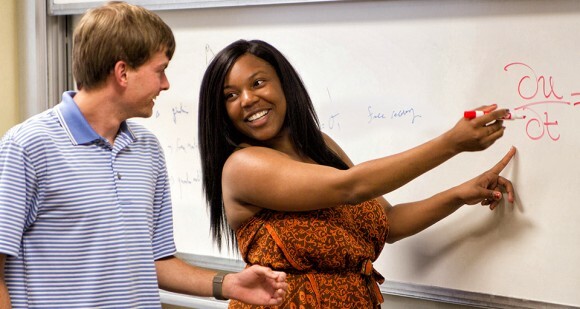 She’s in luck, thanks to the landlocked math-bio program at UNCG. These undergraduate students, ten in total, are conducting research in Greensboro thanks to a National Science Foundation Research Experience for Undergraduates (REU) grant. REUs provide undergraduates with summers of hands-on experience. Students stretch beyond their disciplines, conduct laborious research, and deliver presentations on their findings. It’s a competitive program – over a hundred students from Massachusetts to California vied for a seat in the program this year. Rychtář mentors students Dennis Silva and Nina Galanter. They work with the Territorial Raiding Game, a model that looks at territorial defense and invasion behaviors. In large heterogeneous populations, many factors determine whether a group will defend its resources or raid and acquire new ones. This brand of integration beats at the heart of the REU program. Each of the projects combines elements of math and biology. Dr. Rowell, co-principal investigator of the program, is developing a population dynamics model with his undergraduate research team. It’s a continuation of a 2014 REU project, which models the dynamics of independent and collaborative populations. In independent populations, each organism works towards its own success, but in collaborative populations, group fitness depends on organisms working together. Rowell and his researchers are now updating the model to include instances where organisms change behavior, shifting from independent to collaborative – or vice versa. This summer concludes UNCG’s second Math-Bio REU program. However, the undergrad research collaboration is actually in its 9th year. It started in 2006 with another NSF grant, Interdisciplinary Training for Undergraduates in Biological and Mathematical Sciences (UBM). The program took in eight UNCG undergraduates every year, partnering math and biology students in interdisciplinary research teams. UBM resulted in 25 awards, 41 papers, 57 international presentations, 50 national and state level presentations, and over 150 presentations at the regional level. Undergraduate research has propelled the UNCG math biology partnership forward since the first UBM grant, and the collaboration shows no sign of stopping. The students are getting more than experience, and the professors are getting more than research. 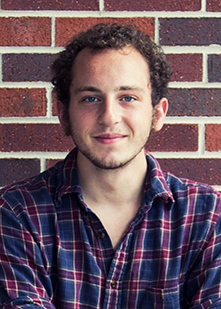 Author Ben Tasho is a Media and Communication Intern with the UNCG Office of Research and Economic Development. He researches and writes articles about the on and off campus impacts of UNCG research. Ben is a sophomore at UNCG, majoring in Media Studies. His interest in writing, media, and education led him to his current position.